Our servers were hosted by Skiplink, Skiplink in turn were housed by TelX. TelX accused Skiplink of not paying the bills and locked Skiplink out of the building and shut off the power to the servers. The servers are still there, with my backups. We dont feel we will be able to get this data back in a timely manner, so we have started again. We will be getting it back eventually at which point I will create a copy of it for copying to this new wiki. This entry was posted in Blog and tagged backup, gentoo, ubuntu on November 2, 2008 by Cecep Mahbub. This entry was posted in Aplikasi Linux and tagged gentoo, linux on May 20, 2004 by Cecep Mahbub. OS Linux Gentoo, Kernel 2.6.3. 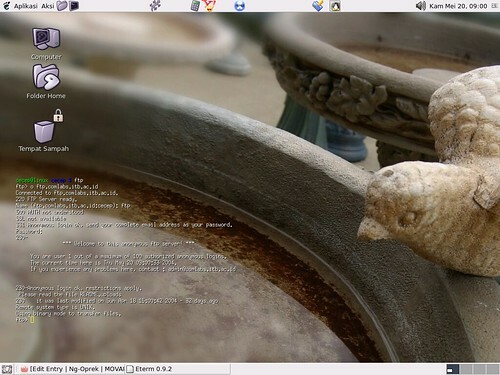 Desktop KDE 3.2, Firefox 0.8. This entry was posted in Aplikasi Linux and tagged gentoo, gnome on March 13, 2004 by Cecep Mahbub.